Hello all! I hope everyone enjoyed the last meeting. It was very hectic for me. We had some technical difficulties that needed to be worked out. One issue was, my camera did not have a battery in it. Therefore, I do not have any pictures of the changing of the board, thanking Ann for her service, naming of Quilter of the Year and Show and Tell. I would like to post some pictures to our Facebook page. So, if you have pictures would you share them with me? Please send them to me by email at liz@swanquilting.com. Or, if you prefer, and you use Dropbox, share your folder with me. I would appreciate any and all pictures I can get. I would like to say a public thank you to all who made this a memorable time for me. Thank you, Ann Hockmeyer for being a great President and for the pin, bell and beautiful flowers. Thank you, Nancy Dempsey, for naming me Quilter of the Year. I was very surprised and humbled by it. And the orchid is beautiful! I really love it. Thanks to Ann Hockmeyer, Betty Hastings and Marianne Karp for their hand in it. Thank you to all members for electing me as President. I look forward to your help and support in the coming year. Thank you to the new Executive Board for stepping up. I look forward to working with you. Thank you to the 73 members who made quilts for Kulea. I am truly overwhelmed by your generosity. 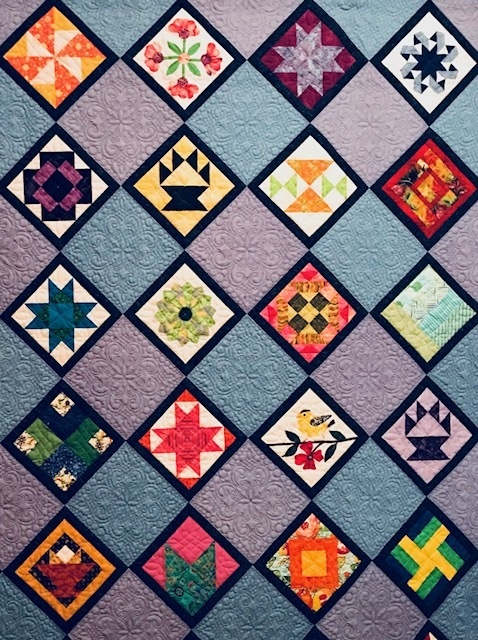 Finally, thank you to the Raffle Quilt committee for a beautiful quilt that, I hope, will make lots of money for the guild. Can wait to quilt it! Lots to be thankful for! Enjoy your summer. See you in September! This entry was posted in Comfort Quilt Project, Guild Activities, Meetings and tagged Request for pics, Thank You.